Milking procedure while using a milking machine. Preparation of the udder prior to milking is an important process in the harvest of high quality milk. The goal is to achieve a clean, dry udder that has been adequately stimulated for milk letdown, with dry teats and clean teat ends. A consistent procedure at each milking is important. The purpose of these steps is to elicit optimal milk letdown, minimize the chances of a cow contacting mastitis organism during milking and efficient milk removal. 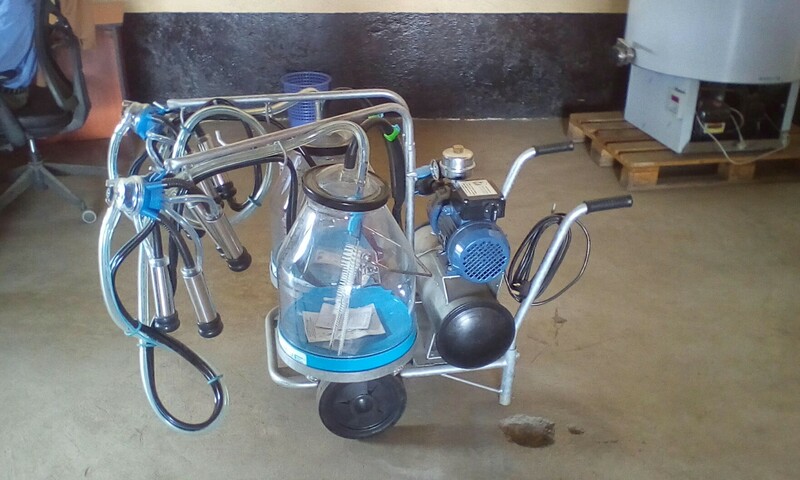 The hands of the person milking cows can become contaminated with mastitis causing pathogens, either from handling dirty equipment or from infected cows. Today most milkers wear disposable latex gloves. These are replaced periodically through the milking process. The teats are prepared by thoroughly cleaning the teat and teat ends with some solution that removes dirt provides some sanitation to the teat skin. Many people use pre-milking germicide dip solution called per a per-dip. This wets the teat, provides sufficient moisture to wipe off the teat and get it clean and sanitizes the teat skin. The act of massaging the teats while wipping them also off also is stimulating the oxytocin release that will cause milk ejection. Use a separate dry towel to wipe off and dry the teats properly. It is particularly important to get the entire teat and tip of the teat clean. When a pre-dip is used, wipping off the teat will remove most of the iodine solution resulting in negligible contamination of milk with the iodine. 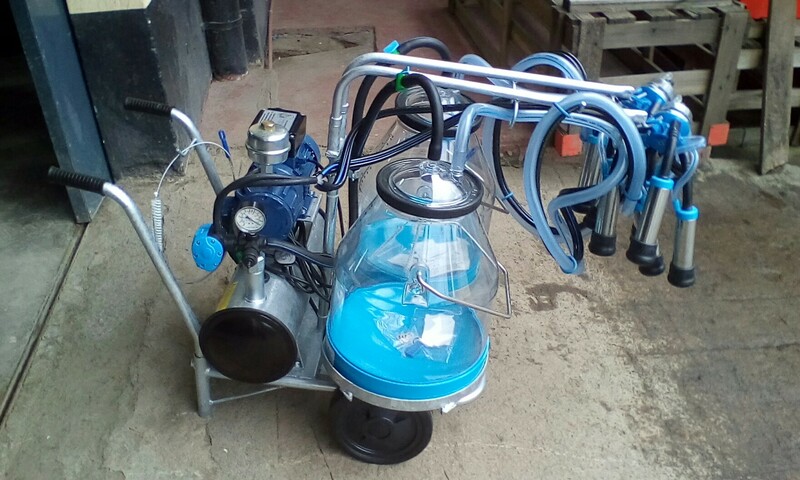 The milking machine should be applied within one minute of the initial wiping of the teats to take maximum advantage of the milk letdown response. The Milker holds the claw in hand, the vacuum is turned on and four teat cups are applied as efficiently as possible, with minimal sucking of air when teat cups are turn up to place on the teat ends. Milk should start flowing immediately. Adjust the machine so that it hangs straight down from the cow. Maximum intramamary pressure caused by milk letdown occurs at about one minute after udder preparation begins and continues for about 5 minutes. Shortly after that, the milk flow will drop to a point where automatic take off will detach the milking machine. Most cows will milk out in 5 to 7 minutes. Post milking teat germicide dipping. The streak canal of the cow teats stays open for about an hour after milking. If a cow teats then come into contact with mastitis causing pathogens, they may easily enter the teat and cause infection. One of the most effective means of controlling mastitis is post milking teat dipping with a germicide. This protects the teats end for a period after milking, kills pathogens that may be on the teat skin and minimizes the potential passage of those pathogens from one cow to the other at the next miking. Mobile Milking Trolleys-Simple, Modern and Reliable. Welcome to Milkline world and to Milkline basic milking machines……… Just connect the plug and start milking. With the basic milking trolleys your work will be easier and faster. They will enable you to milk up-to 32 cows, collecting the milk into 30 litres buckets, which are graduated and transparent in nature to allow you monitor production of each single cow. Milkline basic milking trolleys will also enable you to produce high quality milk with maximum hygiene, assuring stress reduction in your herd. It is possible to carry out very easily a daily washing of the components, which are in contact with the milk. The vacuum pump with graphite vanes does not need lubrication, avoiding in this way working environmental pollution. All the components are of high quality and are produced with the approval of Health responsible organization. The sturdiness of frame and vacuum tank guarantees a long life of your investment. The electric motor on the milking trolleys are of single phase type with power ratings of 0.75kw.